Bid for Serial Copy No#1 of 250, 100% Proceeds to go the Winner of the 4 JAW SMACK-DOWN! If you have ever attended a previous Summer Bash, you may know that at the end of a long hot day a unique 4 Jaw Chuck competition takes place called CLASH AT THE BASH. This year it will be called the 4 JAW SMACKDOWN! It is a duel between two individuals to see who can chuck up and indicate most accurately a complex part that is not always round or symmetrical, the fastest. As the name suggests, it's all won or lost on a 4 jaw chuck. The test is also never fully know until the last minute, so the competitors do not know what to expect. In 2017 Keith Fenner (Turn Wright Machine Works) was able to edge out Adam Booth (Abom79) in the final to secure the Championship. This year 100% of the proceeds from the auction of this No#1 copy will be contributed to the prize money for this years 2019 winner. This copy will also be autographed by all the You Tubers in attendance and this book will contain serial number #1/#250. There is a good chance that there will be no other time better opportunity to obtain the autographs of that greatest gathering of Machinist You Tubers ever again. Prize money is also contributed from other sponsors and attendee's which makes for an exciting event! 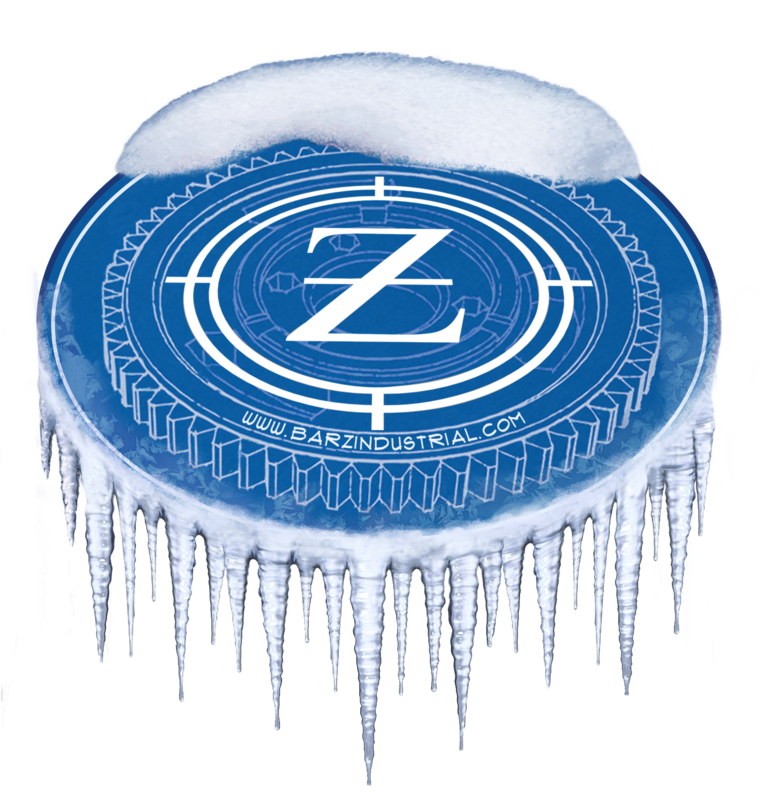 What is the Bar-Z Summer Bash? The "Bar-Z Industrial Summer Bash" is an event organized by Stan Zinkosky from Bar-Z Industrial that takes place during the month of June in Rancho Cucamonga, California, USA every year. The event formerly started as an appreciation day for his customers. However, since it has now evolved into the largest meet and greet of popular YouTube Machinists on the internet today. It is a place where viewers can meet their favourite YouTube Machinist's in person and discuss and learn from one another. The event also includes several educational classes from welding basics to how best to remove broken bolts. A swap meet starts off the day with raffles held throughout the day along with many small competitions run by the Youtubers themselves with great prizes up for grabs. Below is a list of the YouTubers that will be in attendance in 2019. If you have not already subscribed to their channel, please do so and leave them a thumbs up! This list may be subject to change. 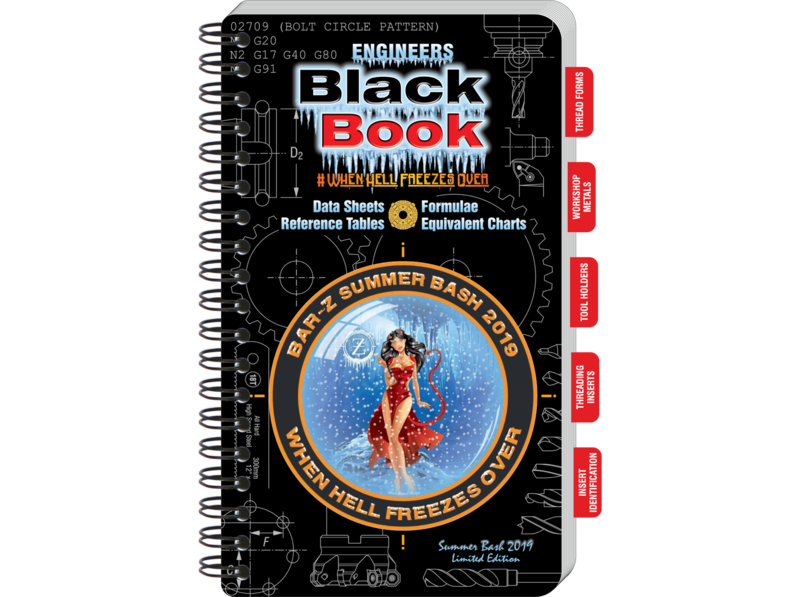 Limited Edition #WhenHellFreezesOver - Engineers Black Book 3rd Edition USA - 250 Copies only! The Engineers Black Book will commemorate the 2019 Bash with a special front cover of this years theme #WhenHellFreezesOver. It will be a limited edition print run of only 250 books in circulation and each book will be especially serial numbered from #1 to #250. The book will be the Engineers Black Book 3rd Edition INCH version only (Not Metric) and it will be the Large Print Workbench Edition that is 9.75" high. All the You Tubers in attendance will keep a copy as a collector's item and attendee's on the day of the event will have the opportunity to win copies during the many raffles held on the day of the event. If you are not in attendance, you still have the opportunity to purchase a copy now until sold out. Any copy you order now prior to the Bash, you will have the opportunity to have your copy signed by the You Tuber of your choice and $10.00 will be donated to support that You Tubers channel. To order, please select from the above drop down menu the You Tuber that you would like your Engineers Black Book to be autographed by and then BUY NOW. As $10.00 from every book is donated to supporting the YouTubers channel, we can only offer one autograph. - Delivery will be within two weeks after the event is held in California on June 22nd 2019, a small shipping fee will be added to your order for US residents, for some oversea's residents it may be extra. If your order contains other items, they will be shipped to you at the same time, otherwise please order separately. - For the autograph, the selection of your favourite Youtuber is required at the time of purchase or we will contact you via email to confirm. - Once all the copies have been sold, a confirmation email will be sent out to re-confirm shipping address and autograph requests.